First, an apology for the incomplete first draft that slipped through my fingers last week! Continuing our theme on safety in the home, we focus this month on the staircase. It rivals the bathroom for serious injuries. Some of you will remember two famous Americans who died after falling down a staircase. Dr Robert Atkins, of high protein / low carb weight-loss fame. Always a controversial figure, one cannot take away from the effectiveness of ketosis in weight loss. The staircase killed both of them, and many others. It has a landing half way down. 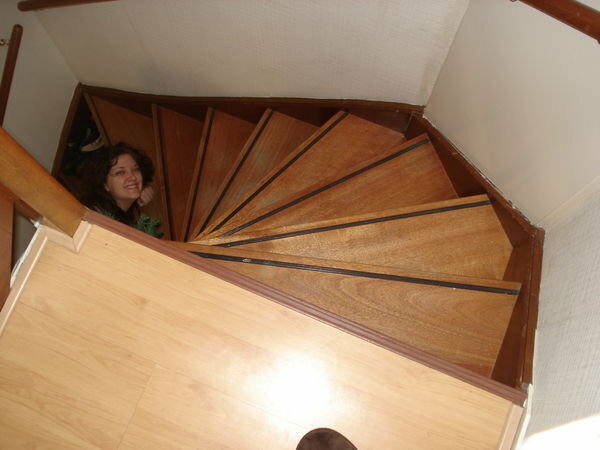 Should you slip and fall, you will only slide down half the stairs max. It has hand rails on both sides. 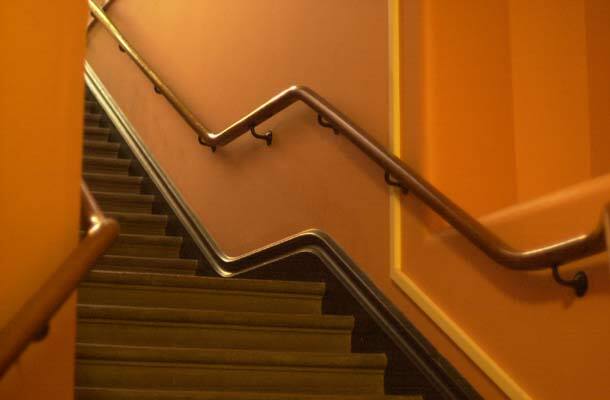 Many homes have only a left-hand rail, catering for right-handed people who may be carrying something down the stairs. It has a generously wide step, and probably has a non-slip guard. Last week I was consulted by a young man with a long history of low back pain. A difficult case, without a doubt. He missed the second appointment. We don't usually give treatment, or only a very light treatment at the first consultation, so I wasn't unduly worried about a heavy reaction to the first treatment, which sometimes happens. When my secretary phoned, his wife reported that he was in hospital for observation after a concussion. Yesterday, he appeared for his Report of Findings, sheepishly admitting that he had tumbled down six stairs whilst carrying a heavy tool box in his left hand. He's left-handed, and there is no rail on the right in their home. Now he has a neck condition, and a shoulder condition in addition to his low back problem. This is where we take issue with insurance companies who say that Chiropractors should give no more than 7-10 treatments in a year. Absurd. But they were quite happy to pay for an MRI of his brain, than really wasn't necessary. Well, perhaps. The Chiropractic Report informs us that Chiropractors in Maryland's managed care networks are being dismissed if they provide more than eight treatments to patients in spine care. How absurd, quite rightly they are contesting their dismissal. Notice the rails on both sides of these stairs, and the half-way landing. Just in case. Incidently, if you have toddlers in the home, you absolutely MUST have a gate at the top AND bottom. Small children too of course can slip and fall, with their little short legs, and should NEVER be allowed to play on the staircase. 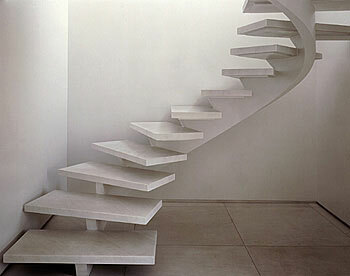 This next example is an interesting staircase that you will probably never see. Fortunately. Analyse it. The next staircase is typical of Dutch homes with tapered steps at the top. It's like the one in my own home. Every morning I dread the last four steps, two cups of tea in my hands. Stupid, one day I'll be sorry for not making the extra trip. Notice the strip of non-skid material built into each step. Stairs come in a hundred shapes and sizes, some very functional, others rather pretty, but always be on your guard, especially at night, and when tired. Had too much to drink? A few thoughts about our friend Dr Atkins, mentioned at the top. There is no doubt that the Atkins high protein / low carbohydrate diet is effective. It is and it works, but ... there are many questions being asked about high protein diets. In general, it seems that in the West we eat far too much protein. In Holland recently a medical study was done on why the Netherlands has the highest rate of breast cancer in the world. One in eight women. Conclusion? Astonishly, a high protein diet. Also, because the Atkins diet does not direct us towards a healthier way of living, at the end of the programme many people slip back, often even heavier than they were in the beginning. Dr Atkins himself was reported to be 117 kg when he fell down the stairs and was killed. However, we do agree that there is merit in greatly reducing the starches in your diet, if you need to lose weight. For more about our healthy free weight loss programme, click here. The shoulder takes a hammering in a fall from the stairs, as one desperately tries to dampen the fall. Taking your full weight, ligaments and muscles, and the capsule are often injured. There have been so many falls in the Netherlands that, in many large companies they have now passed rules that, if you were not holding onto the rail, and fell, you are not covered by insurance. Very sensible too. Many Dutch too have severe knee arthritis. From falls on the stairs, but also from football and obesity. Here is some startlingly effective medical treatment that is in the research phase. Love to read? In this story, Bernard Preston tells a bizarre and tragic story of glider pilot who fell down the stairs, taken from his third book that is nearly finished, called Stones in my Clog. The story is free. Below is a picture of his second book, Bats in my Belfry that you can order by clicking on the picture. Ginger can best be described as a culinary delight. 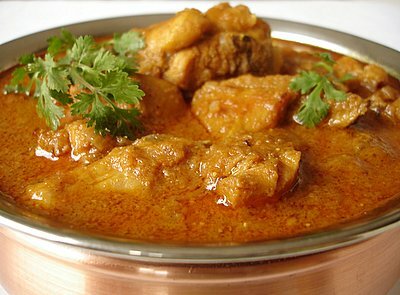 Riding my bicycle home, even in winter with homes tightly closed up, the mouth-watering smells from generations of cooks exposed to the Dutch East Indian cuisine, waft out to greet me. Added to curries and stews, ginger adds mystery and colour to otherwise bland Dutch cooking. I now use it all the time. Indigestion, diarrhoea and stomach upsets. Other claims about flu, heart conditions, reducing cholesterol, headaches and menstrual cramps have not been validated. Yet. They have also not been invalidated. In a large study, ginger was found to be less effective than common medications for nausea, but without the horrid side-effects such as drowsiness, which make driving and flying dangerous. Such medications are not allowed, for example, by glider pilots who experience airsickness. In pregnancy, of course, medication is also not allowed because of the danger to the foetus. It always beats me that a medicine is too dangerous for the growing babe, but it's otherwise quite safe for the adult. In another study, ginger was conclusively better than a placebo for the nausea of pregnancy. Numerous studies confirm that ginger is as effective as ibuprofen, a common anti-inflammatory, but without its serious side effects on the stomach lining. Rather ginger protects the lining of the gut from inflammatory diseases such as ulcerative colitis. Did you know that the hero of the Hudson River, Captain Sully Sullenberger is a glider pilot? He certainly used all his gliding skills that day. Well done, Sully. Grated or finely chopped fresh ginger. Be generous. Chop up the onions, garlic and ginger and curry spices and fry gently in a little olive oil, stirring occasionally. Remove the onion mix and sautee the chicken pieces in a little olive oil, on high heat until golden brown. Turn frequently. Add the curry leaves, the onion mix and the tomatoes and allow to simmer on medium heat for about half an hour.